Prominent & Leading Manufacturer from Nagpur, we offer hand pallet truck and stainless pallet truck. We are leading manufacturer and supplier of Hand Pallet Truck. We are ranked among-st the foremost firms, engaged in offering a qualitative range of Stainless Pallet Truck. This pallet truck is used in factories, warehouses and shipping industries for moving heavy items. 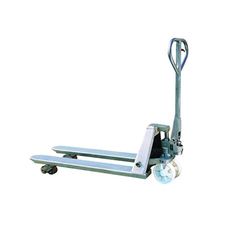 Offered pallet truck is manufactured by our vendors’ experts using superior grade material in line with global norms. Our honored clients can obtain this gamut from us in a wide array of modified options.